Kit Comparison: Heller AMX 30 MBT kit vs ADVmini AMX 30B2 MBT kit. This is a compare & contrast review of these two 1/72-scale AMX 30 model kits. This review will compare the two models so as to help a fellow modeler make a wise choice, and give some tips on building and detailing. A Look At The Box Art: What Is Supposed To Be Inside. Heller released their kit with at least three different drawings as box art, this I believe is the latest release. I find the box art by itself is superbly done and attractive. Atop the turret we see the commander’s cupola ringed with periscopes and with a light machine gun and a spotlight. On each turret side are coincident optical rangefinders similar to that on the M47 and the Panther Ausf. F tanks. Below the rangefinders are stowage racks. The French 105 mm (4.1 in) L/56 Modèle F1 tank gun has a thermal sleeve around it. To the right of the main gun is a coaxial heavy machine gun. To the left is the gun sight with a small open door. The AMX 30 appears to be painted in an overall olive color. The license plate with the tricolor flag indicates an AMX 30 in French service. It would be great if the kit in the box was as nice and as accurate as this box art. 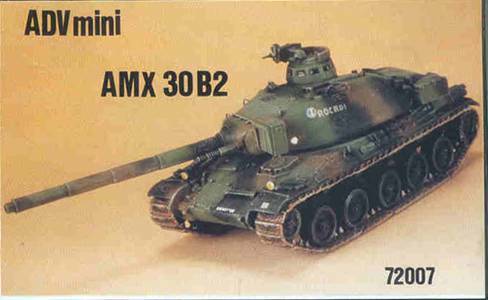 ADVmini’s box art shows an actual photo of the completed AMX 30B2 tank model completed in a three-tone French pattern. The main gun appears the same as that in the Heller kit, but now with a coaxial 20-mm cannon. Like in the Heller box art the vehicle has metal tracks with rubber pads. There is a larger storage box on the rear of the turret than Heller’s AMX 30. The turret no longer has the optical rangefinders on the sides. There is no stowage rack on the turret sides. In the late 1950’s the French, Germans and Italian governments worked together to develop a new Main Battle Tank (MBT) to replace their M47’s. The idea was that Germany and France would develop prototypes and the three nations would all adopt the most successful prototype. As life and plans so often turn out, the Germans adopted their own Leopard 1 armed with the British 105-mm L7 rifled gun, the Italians adopted the US L7 armed M60A1 MBT and later the Leopard 1. The French adopted their own AMX-30 in 1967 armed with their own 105-mm gun. AMX 30 is recognized as being well armed but is very thin skinned for a MBT, with sufficient protection only for small caliber weapons and shell fragments. It’s unique in having a coaxial 20-mm automatic gun rather than the typical light machine gun. 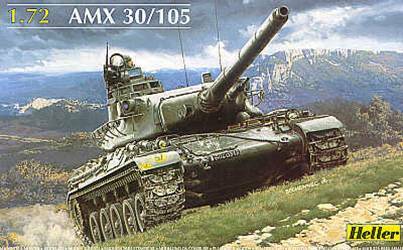 AMX-30 production ended in 1993 with 2300 tanks and 1100 support vehicles. The AMX 30 and its upgraded versions went into service with the following armies: Chile, Cyprus, France, Greece, Qatar, Saudi Arabia, Spain, United Arab Emirates and Venezuela, in which colors it can be modeled. Heller’s AMX 30 can be modeled in the colors of the French and Spanish armies during the 1960’s and 1970’s. The ADVmini’s AMX-30B2 tanks are rebuilds or new production AFV’s with improved fire control, and better NBC protection. AMX 30B2’s also have what appear to be several variations of laser range finders and the coincident rangefinder removed. The AMX 30 was produced over 27 years in several variants. They can be modeled serving in the 1991 Gulf War with Saudi and Quatari forces. I understand that the French used no AMX-30’s during the 1991 liberation of Kuwait. The ADV Mini kit is a resin AMX 30B2 variant that appears largely based on the old injection-molded styrene Heller kit. The turret, wheels, and hull therefore have the same dimensions and many of the same surface details such as: the loader’s hatches, main gun with thermal sleeve and the wheels. Both models come with hatches molded closed. Both kits are missing the turret stowage racks, which is a serious omission. In quality of features, Heller shows it age in good but not great molding. There are little flash and sinkholes but the features are a little soft. ADV Mini’s kit is top notch, with crisp molding with little or no flash. For example, the spare track links on the side of the Heller hull are poor representations of spare tracks. The spare tracks molded onto the side of the ADV Mini model are superbly done and look like spare tracks. The Heller 1/72 scale model has a hollow turret and hull so the hatches could be cut open and crew figures added and an interior scratchbuilt. The ADV Mini 1/72 scale hull and turret are solid and opening up the hatches will be much work. Though more difficult to work with, the resin ADV Mini kit comes with a lot of the excellent surface details molded on so there are fewer parts to assemble. The Heller model’s greatest problem in need of upgrading are the tracks. As seen in the scan, they are two simple plastic strips with lines running across and no resemblance to actual AMX 30 tank tracks, let alone the AMX-30 tracks. In contrast, the ADV Mini AMX 30 tracks are superbly detailed and accurate resin with guide teeth and surface detail on both sides. Coming in short runs of five links each, they will be more challenging to work with. 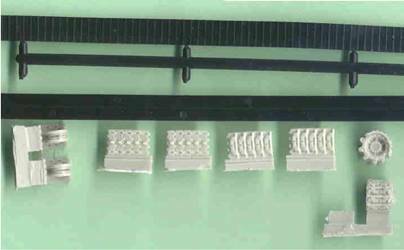 The roadwheels are essentially the same except for the medium of styrene with the Heller and resin with the ADV Mini kit. Heller’s drive sprocket is made with no teeth reflecting the simple track band. If we replace the tracks we’ll need better sprockets as well. ADV Mini’s sprocket & idler are commendable with the track links molded onto the wheel. A nice example of ADV Mini’s attention to detail is the line of holes running along the bottom of the thermal sleeve of the gun barrel (drain holes?). Comparison of the Heller roadwheels and turret parts with the resin ADV Mini parts. 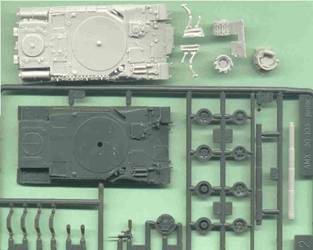 The ADVmini kits have the same proportions and many of the same details but have new features of the upgraded AMX 30B2 tank such as the larger turret bin and no rangefinders. 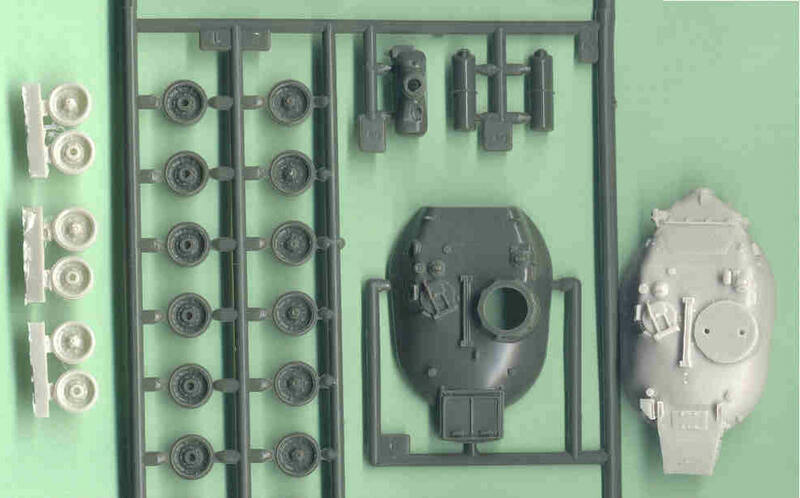 In this photo we have the pale gray resin AMX 30B2 hull at upper left showing much of the same molded-on details with the additional details of the upgraded variant. The molded-on spare tracks have been notably improved. The gun barrels for both kits, at far right, are largely the same. On the ADV Mini turret above the holes for the turret basket has been marked out and will later be drilled to accept the brass wire. This was also done for the Heller turret. Here we see the assembly of the roadwheel bogies; apparently the AMX 30 does not have torsion bar suspension common to so many other contemporary tanks. On each side of the gun mantlet are boxes which I understand hold a laser rangefinder and searchlight. This is a good view of the molded-on muffler and tools. In the above partially assembled Heller model we can see the significant detailing to make it into a presentable display model, including new spare tracks on the hull side, new scratchbuilt headlights and guards, wire lift rings on the turret, and other small details. Holes to mount a scratchbuilt turret stowage basket are visible. 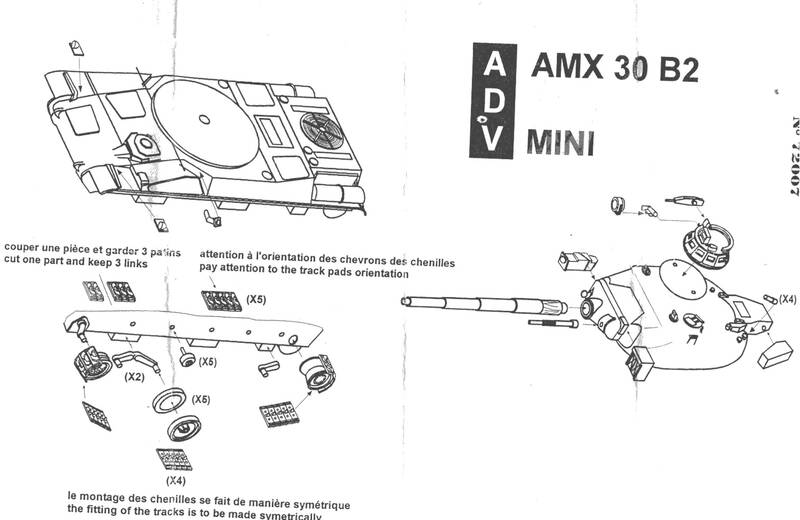 The ADV Mini instructions for their AMX 20B2 kit are the simple, one page, exploded-view type. Like most 1/72 – 1/76 scale resin models the instructions could be more complete, though these are better than in many resin kits. 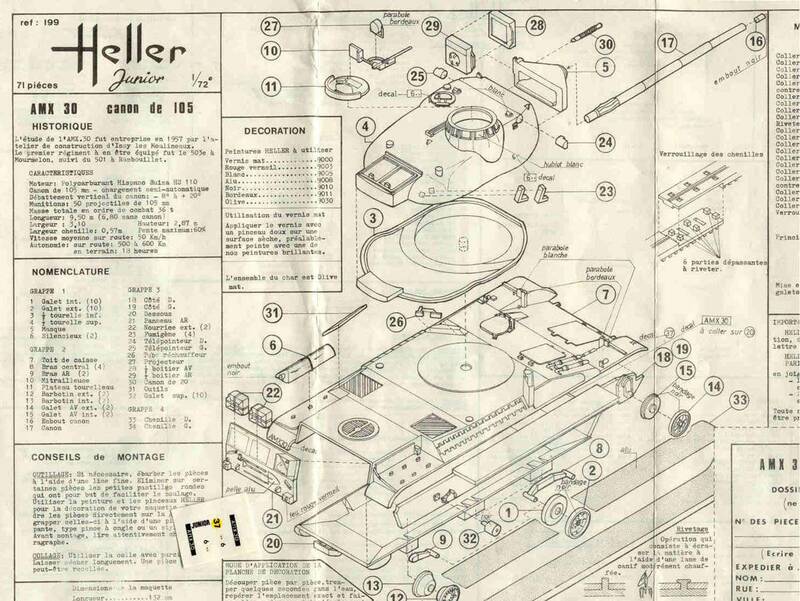 Above is an excerpt of the old Heller kit’s instructions and the kit decals in the lower left. I would prefer the instructions be separated into several progressive steps. Both model kits have exploded-view line drawings instructions for assembly and appear about equal in clearness. They are equally lacking in clearness as well. 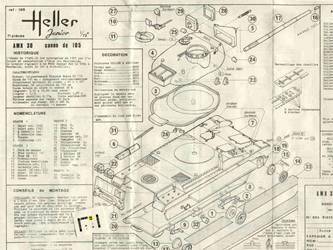 The Heller instructions are more complex as it has more parts. My set of Heller instructions is from an old printing. I hope Heller’s recent re-release has better instructions. The ADV Mini instructions are simpler as many of the smaller parts are molded onto the hull and turret. They are perhaps too simple as the placement of some parts is not clear. In the photos of the partially completed models we can see the added details in brass and styrene. The Heller model needed more detailing to bring it up to a good display model. I refer you to the not-too-plentiful photos on the web and reference books for particular details. The turret baskets were produced using soft copper wire for the vertical bars and stiffer brass wire for the long horizontal rods which were inserted into holes drilled into the turret sides. Stowage like boxes, bedrolls and camouflage netting are common in all the reference photos of the AMX 30 in action. Brass wire grab handles were added to the rear turret bins. The Heller kit had its poor molded-on headlights cut off and rebuilt from scratch. Headlight guards were made from brass strips for both models. The Heller model needs better smoke discharges. I stole mine from extras in the Revell T-80BV tank kit. Wiring was added to the large square IR searchlight on both models. 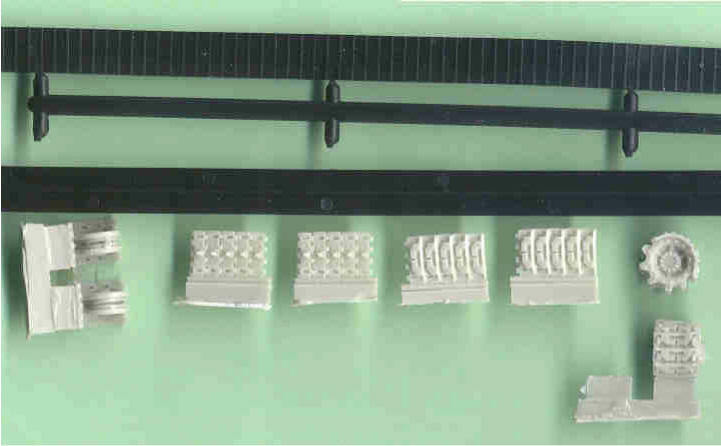 Resin track sections taken from the ADV model replaced the insufficient Heller tracks. As my Heller desert variant has sand skirts, I dispensed with the top run of. The ADV resin tracks were not easy to work with and make the ADV model not ideal for a novice. The Heller kit needed some sort of protective sheets or plates behind and on the sides of the mantlet (see reference photos to see what I mean). These can be produced from paper or thin aluminum. The Heller commander’s cupola had filets of styrene added around the periscope lenses to increase the depth. Periscope lenses for both models were simulated with exposed camera film which is easy to cut and has a good, dark, shiny surface. The poor spare track links attached to the Heller kit’s right hull side were cut and sanded off. More accurate replacement track links were taken from my spares box (PST T-55 track links I believe). On the muffler exhaust outlet are supposed to be hinged covers that come down apparently to keep out water when submerged. These covers can be simply made with styrene discs. Though vehicle markings are displayed in a box art photo of the completed ADV Mini AMX 30B2 model, no markings are included. ADV’s box art is their paint guide for a tri-color olive, black and tan color camouflage. My AMX 30B2 was completed in three-tone French camouflage, similar to the NATO camouflage of the same time period. The model was given a coat of field green, a point wash added in the recesses and around high points, then a lighter coat of green added to blend the dark wash into the color (this helps add depth and makes dry-brushing less necessary). Over this was applied a light brown and dark gray pattern. Markings were borrowed from the Heller AMX 30 kit, and the Extra Tech M10 kit. Heller’s AMX-30 comes with water slide decals for one French vehicle [visible in the lower left corner of the kit instructions scan]. This early version of the AMX 30 may also be modeled in the markings of Spain, Greece, Venezuela or Chile. Heller’s painting instructions are a simple olive green. My Heller model was converted to a Saudi Gulf War 1 AMX 30S tank in a simple desert tan. Over a base coat of tan was applied a point wash of dark brown and black, then a lighter shade of tan to blend the wash in and add depth. Nowhere could I locate clear markings for an Arab, Gulf War AMX 30S so a chevron on the sideskirt was chosen, which I believe, was a standard marking for the Coalition in 1991. The partially painted ADV Mini model with a turret basket made from brass and copper wire. The partially assembled and painted Heller AMX 30S in desert paint scheme and another view of the scratchbuilt wire turret basket, smoke dischargers from a Revell T-80 model, scratchbuilt headlights, and sand skirts from styrene sheet. The dark cupola periscope lenses have not been added yet. The exhaust muffler caps and other unpainted details are also visible. 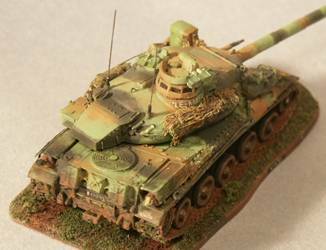 Left side of the completed AMX 30B2 with added stowage in a northern European camouflage pattern and a base made from thick styrene sheet and model railroad grass. Note the lack of stereoscopic rangefinder bulges on the turret sides, an identifying feature of late AMX 30’s variants. Radio antennas for both models were simulated using plastic paint-brush bristles. The periscope lenses made from exposed camera film have been installed with white glue. This is my first ADV Mini model and I am quite impressed by the quality. With the ADV Mini and AlBy companies, France has a lot to be proud of in the small scale modeling business. 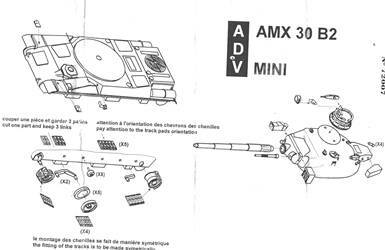 The ADV Mini AMX 30B2 kit I recommend for intermediate and advanced modelers. The Heller AMX 30 makes a great wargaming piece and a modeler of intermediate and advanced level should be able to make it into a fine display model. 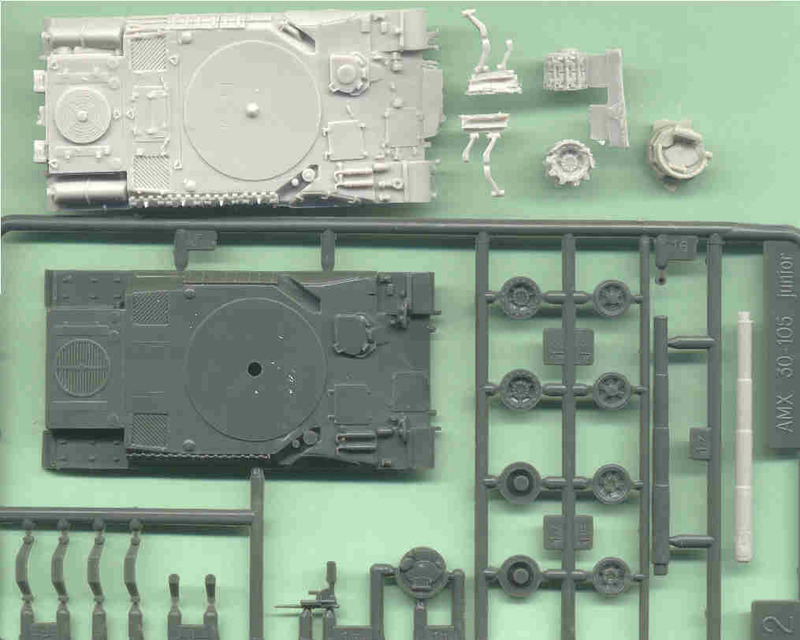 The resin AMX 30B2 can be easily converted to a desert variant with sand skirts and a few other changes. An interesting option for a conversion is the AMX 30B2 Brennus, which has ERA blocks over the bow and turret. The substitute tracks I used for the Heller kit were stolen from another model so had to unfortunately mask the incorrect track links with mud; please forgive me. The track teeth were scratchbuilt from styrene and glued on.